LA MESA – The Helix Highlanders will have the services of two of their biggest stars on Friday night, both of whom have missed significant time due to injury, while the Scotties battled through one of the section’s most difficult schedule. Helix senior FATTO NOA, who missed nearly three games, and senior quarterback DANIEL AMON, who was knocked out of a game two weeks ago and missed last week’s contest with Cathedral Catholic, lead the eighth-ranked Highlanders against sixth-ranked visitor St. Augustine at Benton Hart Stadium this Friday night at 7. Noa returned against the Dons and had 25 carries for 221 yards and two TDs, although Cathedral rallied in the fourth quarter to win, 30-21, sending the Scotties to their third defeat in four starts. 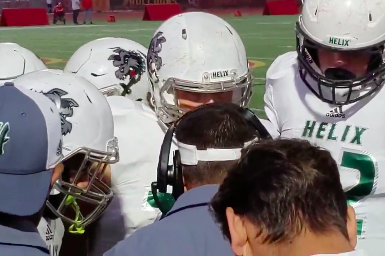 Helix was up to the task at the line of scrimmage against the fourth-ranked team in the county, but ultimately, the Dons’ special teams determined the outcome. Helix led midway through the fourth quarter. Despite the pollsters downgrade, Helix is still sixth in the county power rankings, while the Saints are fourth. That still means that this game has a huge impact on the Open Division playoff bracket. Saints blanked a pretty decent Otay Ranch team last week and are just flat-out on fire right now. St. Augustine is led by running Byron Cardwell (453 yards, six TDs), and wide receiver with Sam Scaife, while QB Angelo Paraza looks for tight end Michael Ambagtsheer. The Scotties lead the series 7-2, including a win last season and in the 2015 CIF championship, 44-30; the teams split in two-game series in 2003-04. One previous meeting was in 1955, prior to the creation of the San Diego Section. When the SDS was created in 1960, Saints did not join for several seasons and stayed in the Southern Section. The home field should carry… HELIX, 28-27. OTAY RANCH at STEELE CANYON – Steele Canyon senior quarterback NATHAN BARNETT has a feel for the end zone. Barnett rushed for four touchdowns last week in a win over Bonita Vista and a pair of critical scores late in the contest to beat Brawley, 14-13, two games ago. Last season, the Cougars beat Otay in the South Bay by that came 14-13 count, so consider this one to be just as close, as Steele is 11th in the section’s Division I power rankings, while Otay is 10th. Junior ANTOINE WALKER returned the opening kickoff for a touchdown last week and junior JUNIOR AKINTUNDE came back from injury and scored a touchdown. Senior IAN MILLER had two sacks last week, while CAMERON EWERT had an interception in the win over Bonita Vista. Otay’s losses were to Saints and fifth-ranked San Marcos, but the Mustangs’ wins have come by a combined six points. Otay Ranch quarterback PUKA STEWART has 660 totals yards this season, and running back NOAH ISLEY averages 7 1/2 yards-per-carry. These two have been opponents for a few years now but the home field hasn’t necessarily been a factor… STEELE CANYON, 17-15. RANCHO VERDE at GROSSMONT – Grossmont did itself no favors in scheduling Rancho Verde, of Moreno Valley, just two weeks ago after a previous opponent backed out. The cancellation forced the Foothillers into an untimely bye that put them into a bit of a funk against Eastlake last week. The Foothillers were shutout on the road by the seventh-ranked Titans in an obvious let-down spot. Grossmont shouldn’t have any trouble getting up for this home game, but the obstacle that Rancho Verde presents is the real challenge. The Mustangs, out of the Ivy League in the Southern Section, are 3-0 and ranked 38th in the state. They are ranked second in the Southern Section’s Division 2. The ‘Stangs are a ball-control oriented team with senior two-star running back Xavier Ogorgi, a Sacramento State commit. The ‘Stangs average almost 10 yards-per-carry as a team. But they are also averaging almost 20 yards per completion with freshman quarterback Aj Duffy. Grossmont senior ZAK FARRIS is emerging as one of the best possession receivers in the county. He grabbed seven catches against Eastlake and has 12 on the season. The Hillers’ defense was busy last week, as junior CHRIS ALBA had nine solo stops. There will be plenty of work to go around on Friday night. It could play to the Hillers’ advantage that RV High has taken on this road game so late, but that will only close the margin… RANCHO VERDE, 34-24. HILLTOP at GRANITE HILLS – The 3-0 Eagles host Homecoming after the thrilling road victory in the North County last week. JUSTIN MCELLIGOTT was McElli-GOOD with his game-winning field goal in the second overtime to beat Westview. The game was ruled by the defenses, and appropriately, the first score of the game was on an interception return for a touchdown by ETHEN BISHOP, who returned a deflection by teammate BAILEY CHRISTIAN 53 yards for the lead midway through the fourth quarter. After Westview sent the game into overtime, senior quarterback CRIS OSTRENG rushed for a touchdown, then McElligott won it after the Wolverines had scored in OT. Hilltop loves to throw the ball, which doesn’t seem like the best of game plans against these Eagles right now. The Lancers have lost to some pretty decent teams and beat San Ysidro, 39-0. The Eagles have won 11 of their last 12 games and are a considerable favorite here… GRANITE HILLS, 38-14. VINCENT MEMORIAL at SANTANA – Last year, the Sultans won the highest-scoring game in Santana history, 50-43, against the Scots when the teams met at a semi-neutral field at Southwest High in El Centro. Vincent came into that game undefeated, just as it does this year. And just like last year entering the meeting, the Scots are the top team in their division. The teams would appear to be very evenly-matched but the power rankings don’t take into account the key injuries to probably Santana’s two best players. The Sultans got a great opponent to try and work things out last week against Clairemont and senior SEAN IVERSON, who has stepped in to play quarterback went 7-for-8 with three touchdowns. Iverson knew what to do and that was to get the ball to receivers RANDY SMITH and CHAZ BAKER, both of whom scored on touchdown receptions. Junior BROOKS MOUTAW has to take up more of the rushing load now, he had 95 yards, including a 31-yard score against the Chieftains. Santana led 14-7 before pulling away in the second half. Moutaw rushed for 170 yards and four touchdowns in the meeting last season, so the Sultans have to think they have the formula to beat the Scots. Before last year’s wild tilt, Santana’s highest-scoring affair was a 49-40 loss to Oceanside in a CIF playoff game at Mesa College in 1999. The Scots use a 2-to-1 run-to-pass ratio but have been intercepted six times, so look for COLTON SNIPES and MICHAEL RICHTER to pick up the slack in the Sultans’ short-handed secondary. The Sultans have an impressive all-time record against Imperial Valley schools, going 13-6-1… SANTANA, 27-24. IMPERIAL at MOUNT MIGUEL – Mount Miguel’s stock continues on the rise with the emergence of live-armed sophomore quarterback J.D. LAVERDIERE and junior target JAHEIM ALLEN, who had two touchdown receptions against Santa Fe Christian last week. In an underdog role against the visiting Imperial Tigers, the new-look Matador offense finds itself matched up against a Tiger secondary that has 10 interceptions so far this season. The Tigers have their own receiving threat in junior JOEY RAMOS, who has 22 receptions so far. Senior QB Santiago De La Torre has over 800 yards of total offense. Imperial is 2-2, losing at home against Valley Center last week. The Tigers have shut out Holtville, 46-0. Mount Miguel won at Imperial last year, 20-14, as LARRY YZAGUIRRE caught a touchdown pass in that one. A win here would quickly turn the Matadors’ fortunes around… MOUNT MIGUEL, 22-20. CORONADO at MOUNTAIN EMPIRE – A pair of 3-1 teams square off in a game that the computers rate extremely close. The RedHawks have recorded three consecutive shutouts, Dave, after a 20-0 win last week in Yermo over Silver Valley. Sophomore EFRAIN PENUELAS registered a couple of sacks and CAMERON WILL had 11 tackles. Seniors MARQUIS DAVIS and RYAN SAWYER combined for nine receptions and ESTEBAN CASTILLO rushed for a touchdown. The Islanders suffered their first loss last week at the hands of Mar Vista on the road, 34-7, but they beat Maranatha Christian to open the season. Coach Kurt Hines’ team is led by junior quarterback Colter Maldonado and senior defender BRYCE ALEXANDER. This series started in 1926 and the Islanders lead 8-1, with the only Mtn. Empire win coming in 1985, 14-10. Coronado won 74-0 in 1931… MOUNTAIN EMPIRE, 28-27. EASTLAKE at VALHALLA – The seventh-ranked Eastlake Titans were impressive in dispatching the Grossmont Foothillers back to La Mesa with a 35-0 defeat. Using a power running attack, Eastlake scored three first-quarter touchdowns against the Hillers. The Titans have over 1,000 yards rushing over the first four games. They have six backs with 100 yards or more, including senior Parker Merrifield, who has over 250 yards. Sophomore quarterback Richard Colmenero III has thrown for over 700 yards. 13 different Titans have caught passes this season. The Eastlake defense limited Grossmont to just five first downs and 115 total yards last week. Senior middle linebacker Josh McCurty leads that group. The Valhalla Norsemen (0-3) led at halftime of their last game two weeks ago – a 25-13 loss at home versus Mount Miguel. Valhalla sophomore quarterback Luke Pillsbury connected with Zach Larson midway through the second quarter and the Norsemen led the Matadors, 7-6, at intermission. Kegan Baker finished with 115 yards on 19 carries against Mount Miguel, including a 52-yard run. Helping Pillsbury are receivers Kiare Worthy, Karan Jones and Benito Gonzales. Pillsbury had 156 yards in the loss and found his trio frequently. Worthy, who had a 46-yard touchdown reception against the Matadors, is one of the county’s top return men. The Norsemen have some unheralded strength on the defensive front with Johnny Meram, Raymond Sanchez, Kyle Grygiel, and Allen Kalash. Right now, the Titans are nearly an immovable object… EASTLAKE, 42-14. EL CAJON VALLEY at SWEETWATER – The Braves travel to face fellow win-less team Sweetwater in National City. El Cajon senior Brandon Robinson has five receptions for 113 yards this season, including a nice 38-yard play last week. Sophomores Joe Malone and Demarius Hyde have both rushed for over 100 yards for the Braves. DARRYL TAYLOR had a sack for the Braves last week. Running back Luciano Estopier is Sweetwater’s leading rusher. The Red Devils won last season, but Braves were later awarded a forfeit, to make the series 3-3 since 2008. All of the previous games were in 1961 or earlier, as the Red Devils back then went 6-1-1 again the Braves… SWEETWATER, 32-19.